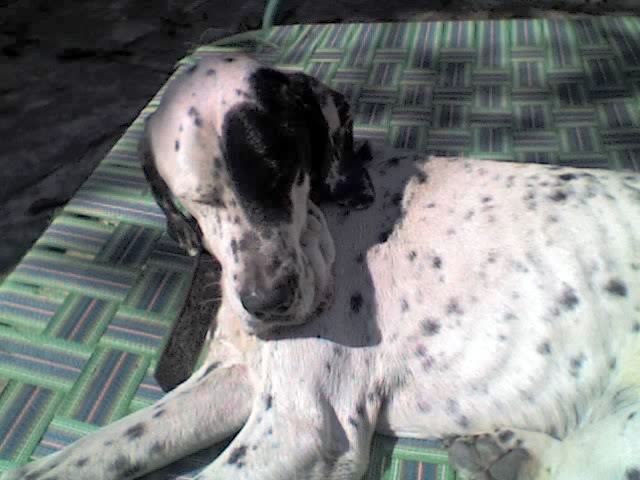 That spotted Dalmatian-mixed-with-Pointer with a pirate patch around one eye and a black and white living of 12 human years. The brat who sneaked up our quilts at dawn, resting his head on the pillow and kicking us till every rib was awake, with a wagging tail that hurt the shins. The dog who had the remarkable ability to dislodge us from the charpai and plant his behind there, making the winter sun position itself for His Highness’s snooze time. The one who ate every leechi that fell not caring about dire gastric consequences, and made every raw mango that monsoon dropped into our yard his play-thing. There went the ambi ka achaar! He preferred boiled vegetables to bones, and flaunting his stuff every morn tied to the main gate, looking at the beauties walking down Rajpur road. Energy he was when young, and a guardian angel when older. For was it a mere coincidence that every time a family member took ill, he "took upon himself" the same ailment, even as his owners got hale and hearty? Timmy was a member of our family. He came to us at 2 weeks and stayed with us for all of our schooling days – like a baby one has to rear with care. And that meant responsibility. Timely feeds and healthy food, hygiene and ample place for exercise, company and cocooning from loud sounds, vet visits and fun rides in the car, complete. So much responsibility, that my parents barely holidayed away from home for they had not the heart to leave him in a dog hostel or the confidence to take this 30 kg fellow along. And like all other pets, he made us understand what it is to love an animal, to the point of not thinking him to be one. He made us feel compassion and care for a mute being (but with different barking sounds for different needs!). A kinship not out of blood or community but one born in the heart and borne within us all. No wonder then that the biggest atheist in the house prayed for him when the doctors gave up on his parvo-virus attack, and he lived. No surprise either when children took turns to bathe him, aunts to feed him and uncles to walk him. Timmy was named after my mother’s first dog as a child but stood for beading the members of this family in one beautifully made necklace. Eventually, he was put to sleep. Because those who know said it was the right thing to do. There was no question of delaying it. Not even out of attachment for him. And today, after all those years, I look around to see how ‘pet parenting’ has undergone an oceanic change. We love them, and we also love to display them. Like a … menagerie. Maybe out of that feeling of kinship I talk about or perhaps just out of pride, both somewhat justified. Social media shows us Spotty Sharma who maintains a blog and Goldie Garg the fish who has an FB account and congratulates you on your new baby. Mithoo Mehra, the parrot, tweets in 140 characters to Omar Abdullah in Kashmir and Nuki Nathan, the turtle, swims in our aquarium, banned as a pet but a children’s delight nonetheless (Just like Amarinder Singh’s exotic bird collection!) And then for some, the more imported the pet, the greater the reason to carry it like a designer bag for the expats’ party in New Jersey. Yes, we like to display them as prized possessions, much like our holiday pictures, or our children winning debate competitions. Out of love or out of pride, while the reasons remain justified, the green eyed monster in me rises every time I see a good looking dog or a sweet little kitten adorning someone’s house. I feel a pang of jealousy, even as I take vicarious pleasure in spotting lovely dog pictures on the www, or with those lucky evening walkers with a leash around their hands. In such moments, I get that close to getting myself some fur-and-bones to love. But, I am not ready to bring in a pet. Not as yet. Not because I am too attached to let go of Timmy but because keeping a pet is akin to becoming a parent to me, just like it was for my parents. It comes with that R-word I only recently learnt to spell. While I simultaneously envy and congratulate those who keep their animals with so much love and how, I need to wait my time to be more ready than this to become a “pet parent”. I smile as I conclude, remembering the first ever 'essay' I wrote in school, a copy of which my mother must have preserved, although I hope to dear God she did not. It said 'My Dog', with 5 sentences which went - 1. I have one dog. 2. He has two ears. 3. He has one nose. 4. He has one tail. 5. I love my dog. While I had got the spellings and the numbers right, little did I know then that I would grow to love a real dog as much as the hypothetical one written about in the four-lined notebook. And little did I know then, that after all those years, I would write another 'My Dog'. But about a real one, this time! It is really emotional to let go of a pet. I have seen my friends do that and it is heartbreaking. I agree, bringing up a pet is just like bringing up a child. It is lot of responsibility. A lot of responsibility, Jas. I can so so so relate to this. We do not take vacations as a family, all together, because our fur babies live with us. And we do not trust vet hostels to leave them at. We do not trust servants when it comes to them. So when we plan a vacation its always with a rider - who stays behind? :) exactly how it has been in my house. They are family, after all! beautiful post for sure... sorry about your loss.. It broke my heart. But a smile lingered somewhere. Stay blessed! So true, Sakshi! As someone who is raising a pet, I feel completely like a parent all over again. All those years ago, my mom and dad were so reluctant in keeping a pet that we finally got one when I was completing graduation. Today, the hardest part is leaving Coco at a kennel when we go out. They are the best friends, the most selfless, the most loving and giving creatures that God has created. I am so blessed to have him in my life. Like you rightly pointed out, it must involve a lot of thought before becoming 'pet parent.' It breaks my heart when I see dogs and cats who are neglected and locked in day and night. Just recently Gautam had to write 5 sentences on his favorite pet. He didn't even need my help to pen that one :). Oh I love your dog, Rachna, and it's not even mine, that handsome hunk! I can very well understand what you are saying. They are indeed a blessing to have. And I am sure Gautam penned something which echoes our feelings here. I'm so sorry for you loss Sakshi. 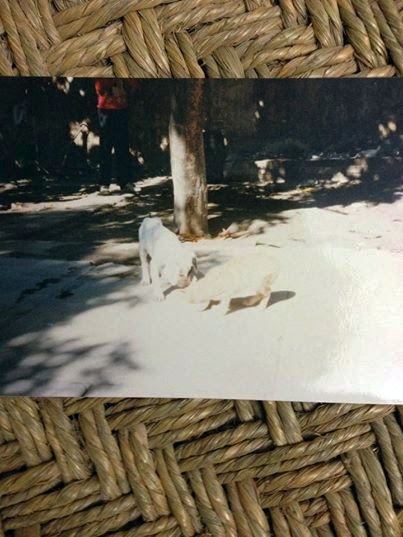 I lost my dog at the age of 13, he was 13 too. We grew up together and he was my best friend. When he died, I went into depression. Bordering a nervous breakdown. I struggled to come out of it. I somehow did, but till date cannot think of getting a new dog to replace him. Its too hard for me. My then boyfriend, now husband had a dog at his place. I used to play with him a lot. A month after marriage, he passed away too. He was 15. Too much for a dog they say, but the little attachment that I had with him was enough to trigger another depression. Its a heart breaking feeling. No one and nothing else can replace the love of a dog. I agree with you, Soumya, no one and nothing else can replace the love of a dog. Like I said, I too am not ready to usher another one in yet. But I want my son to enjoy pet company just like I did. So, sooner than later in will come a wagging tail and change our lives forever. Such a moving post, Sakshi. I know how difficult it is when pets go away, even though I haven't had a pet. I have seen instances where the domestic animals are sold off ( say, cow or buffalo or goat) and the pain it causes. :) Surely! Thanks for reading, Amrit! Being a mother to the 14 fish in our aquarium I could so relate to this post of yours. We never had any pet as kids and the aquarium was Anu's birthday gift from her dad. It was only after we brought it home that I realized that I was so passionate about them. They are indeed a huge responsibility, just like parenting. But just as I love kids, I love watching them run up to me (of course till the glass barrier) early in the morning, even before I put up the light to feed them or when I get back home in the evening. It's such a motherly feeling and it aches when one of them parts. It's like a piece of your heart tearing apart. Indeed, Rekha, I have seen their hungry excitement for you when you approached them. It is the first time I saw fish 'reacting' such. I never took them as such responsive beings. Somehow, while we keep thinking of how attached we are to our pets, we miss noticing the kinship they feel towards us too. May none of the 14 have to part from your loving family. Such a beautiful post. I am sorry for your loss. I can relate because I lost my pet too. It is coincidental that his name was Jimmy. I was just 10yrs old but I remember how he died right in front of me. I still remember holding his paws as he attempted to walk like a human. We never got a new pet after him. This had me teary eyed, Sakshi, with a smile lingering on though, throughout. Wish the best for Timmy, wherever he is now. One of the few pictures I have of him. Thanks for being here, Poonam! Its so sad to lose some one, as close as a pet specially.But lets face it they bring immense joy too. Beautiful writing. I can so relate to this. Pets are the best. very well written...does manage to strike a chord within.. I'll be honest, Jemina. Those FB accounts seemed bizarre to me too, till I started writing this. And then I realised, just like I love sharing my boy's pictures, wouldn't I have done the same for Timmy too? I do think it is love. And goes to show how much a part of their lives the four-legged creatures are. What a lovely post. I empathize with you coz I am also a pet parent. Though Rinky does not sport FB A/c or Personal Blogs or micro blog on Tweeter, yet I have more than often written about her and before her about our dear old Mr. Snow Boot who is now no more. To have loved and lost a four-legged. Your post brought back some lovely memories of our family dog we lost a couple of years ago. :) Thanks for stopping by, Rickie. Will read. Thanks a lot, deekay. I have never had a pet. When my dad bought one, I was in hostel for most of his stay until he died an untimely death due to an accident. Since our house was just above a pump and vehicles came in to refuel all day long, my dad never supported the idea of having another pet and losing him to a tragic end. I think I understand his point of view, Sugandha. This is such a beautiful post Sakshi! Sakshi, you have written this post in a very beautiful manner, capturing your feelings and writing them so vivid. I as a reader was transferred to your dehradun porch. :) Love to timmy, wherever he is. :) Thanks for reading, Seeta. Cute five lines on 'My Dog' you wrote in school and shows the love. I am sad for your loss but I am sure Timmy is always with ur family. What remains is lovely memories. Feelings beautifully expressed and one can feel the love for Timmy. Hugs to you, I feel your pain. We lost our Sparky on 7th May and are still looking for her at home, under the table, on the sofa, in bed, and wishing she were here with us. Every time I find her hair on the pillow, or the sofa, I break down. She was my baby girl of 11.5 years, I have lost a daughter just before Mother's Day and I can't stop grieving. I am sure she is with Timmy and they are having a great time in doggy heaven. I guess, as time goes by, we stop expecting them to suddenly make an appearance pulling our blankets or whining for a car ride. But pet-memories have this proclivity to come gushing back the moment you read about another's pet. I guess this is something that binds us all together. Such is the effect of having experienced and lived richer with pets. 'Fur kids' - love that! Thanks for reading, Vinodini. I'm very glad you are here. I lost my pet 4 years ago n every memory seems like yesterday only...These canine wonders spark up our lives without asking for much in return. I miss mine terribly. Not thinking of another one?